When the sun shines people like to go to the beach. The Dutch are no exception. However, how they get to the beach is perhaps a bit different. See the video for thousands of bicycles parked at a beach near Assen on a sunny week-day afternoon during school holidays. How hot was it today ? Today the official temperature according to the local weather station reached 34 C. Our own thermometer in the shade in the garden said 37 C, but I don't do "hype" so let's trust the official figure, presumably taken by a proper calibrated thermometer sited in a way that corresponds to some official standard or other which leads to consistent readings, above our cheap domestic digital thermometer. Isn't 34 C "too hot for cycling" ? It's often the case that people elsewhere claim that their high temperatures make cycling impossible "because it's too hot". Others claim that they can't cycle "because it's too cold". Now I don't doubt that in some extreme parts of the world it is sometimes genuinely too hot or too cold, but I've yet to see a temperature here in Assen at which people stop cycling. the beach. When it's cold they ride to go skating. The difference between summer and winter temperatures in this area is very broad indeed so we can make a range of comparisons with places where it is claimed to be "too hot to cycle" as well as those where the claim is that it is "too cold to cycle". People cycle through all seasons in the Netherlands, and as the weather station we use is based half way between Assen and Groningen, and the highest rate of cycling in the world is in Groningen, I think we can safely say that any temperature which is within the range of what is recorded by our weather station is not too extreme for cycling elsewhere either. Peak temperatures are of course lots of fun. The hottest temperature recorded since 1981 in this area is 34.7 C, not all that much hotter than today when I shot the film above (it was really lovely cycling weather, I went out just to go to the beach but rode another 20 km anyway because it was so pleasant), and the lowest recorded was -22 C. The lowest we've experienced since we lived in this area was -18.6 C in March 2012. People kept on cycling when it was that cold just as they kept on cycling today when it was hot. Climate data for Groningen Eelde airport, approximately mid-way between Assen and Groningen. The average summer high temperature is 22.2 C while the average winter low is -0.6 C. Note that these are averages and that temperatures outside those averages are not uncommon. Peak temperatures in Groningen have hit 34.7 C and the lowest was -22 C.
I'm going to compare average summer highs and average winter lows from from now onwards. These are far less dramatic - the average high in July here is 22.2 C and the average low is -0.6 C in February. That sounds much less dramatic, and of course we get higher temperatures than this every summer and lower ones every winter. These temperatures are consistently recorded and make the best base for comparison from one place to another so they are what I will compare with below. As you can see, Auckland's high temperatures in summer are on average only 1.5 C greater than Groningen. In my view, Auckland has an almost ideal climate for cycling or any other outdoor activity. It's never really too hot and it's certainly never too cold either. You guys hardly ever even have grey skies like we do in Northern Europe. Get out there and enjoy yourselves ! Also note that in Auckland "The absolute maximum recorded temperature is 34.4 °C". This is actually lower than we've experienced in Groningen and Assen on several occasions since we moved to the Netherlands. Auckland is the largest city in New Zealand and also the warmest city. All the other cities are further South, so colder. The capital of New Zealand is Wellington. Wellington's climate is very mild. Average highs in summer are 20.3 C while the average lows in winter are 5.9 C. The record low was just -0.1 C while the record high was 30.1 C.
What about Invercargill, right down on the south coast of the South Island ? Invercargill is not only the southern-most city of New Zealand but also one of the southern-most cities in the world. It's also known to be the coldest city in New Zealand. Summers are relatively mild there with an 18.8 C average high, but it's perhaps surprising to find out that the winters are quite mild as well. Even Invercargill's average winter low is well above freezing at 0.9 C. Much milder weather than winter in Assen and Groningen, where the average winter lows are below freezing. I conclude that there is nowhere in New Zealand where it makes sense to claim that the weather is either too hot or too cold for cycling. In fact, New Zealand's weather is perfect - especially around Auckland. Aberdeen turns out to be quite similar to Invercargill. Both of these cities have temperatures which reach neither so hot as Assen and Groningen in the summer nor so cold in the winter. The "coldest city in the UK" has temperatures which fall well within normal for Assen and Groningen, so temperature is not the reason why people don't cycle in that city. 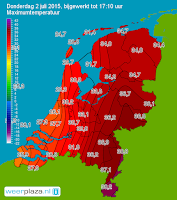 Similarly, cities on the south coast of the UK, where it is warmest, have temperature ranges which fall well within normal for Assen and Groningen. For example, Plymouth (where I studied) has average highs of 19.8 C and average lows of 3.6 C. Really nothing to get excited about weather-wise. You need to look elsewhere than the weather for the reasons why British people cycle for such a small percentage of their journeys. Climate data for Sydney. The warmest we've looked at yet with average summer highs of 25.9 C and average winter lows of 8.0 C.
Sydney at last offers somewhere which is absolutely definitely warmer than Groningen in the summer. the average high on the warmest month of the year is 3.7 C warmer and four other months are also at least slightly warmer than the peak here. However, this also means that seven months of the year are cooler than the warmest Dutch months. It might well be that an average 3.7 C higher temperature on the hottest month of the year reduces cycling a little in Sydney relative to Groningen, but I'm not so sure. Today's temperature in Assen was considerably higher than an average high in Sydney and it was very pleasant to cycle. It doesn't seem logical to think that a 3.7 C difference is enough to explain why just 0.8% of commutes are by bicycle in Sydney but even if we accepted that this was so, shouldn't the city be able to make up for this with a higher rate of cycling for the four months of the year when Groningen's average low temperature is lower than the lowest temperature ever recorded on the worst day ever in Sydney's history ? Believe me, it's much more difficult to cycle when it's really cold than when it's really hot. People used to cycle in Australia in large numbers. In the 1960s, school cycle parking in Australia looked much as it does in The Netherlands now. It's no hotter now than it was then. Climate data for Toronto. Average peak in the summer is 26.6 C. Average low in the winter -6.7 C.
Toronto has the most extreme variations in temperature seen so far. In the summer it's hotter than Sydney while in the winter it's much colder than Groningen. I'm still not convinced that the average high is really much of a deterrent to cycling, but temperatures that low might well be for many people. Also note that Toronto isn't all of Canada. Vancouver by contrast has relatively mild weather, about the same as Groningen in the summer, not as cold in the winter. I wrote about Ontario recently with regards to the low quality of the recommendations of their new Bicycle Facilities manual and this is something that Canadians with an interest in cycling should keep an eye on. Average commute lengths in all Canadian cities certainly are not a problem. Not single one of the big list of myths and excuses explains why people don't cycle in other places as they cycle here. However the claim that "it's too hot" or "it's too cold" is used in many places where temperatures are not really particularly hot or cold. The main reason why people do not cycle, regardless of where they live, is that the conditions simply don't feel safe. 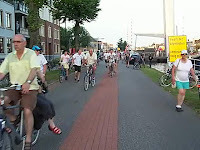 a high degree of subjective safety is required to make people want to cycle and to achieve this people must be able to complete their journeys by bicycle without being threatened by cars. This requires a comprehensive grid of very high quality cycling infrastructure. The better the conditions for riding a bike, the more people will choose to do it. 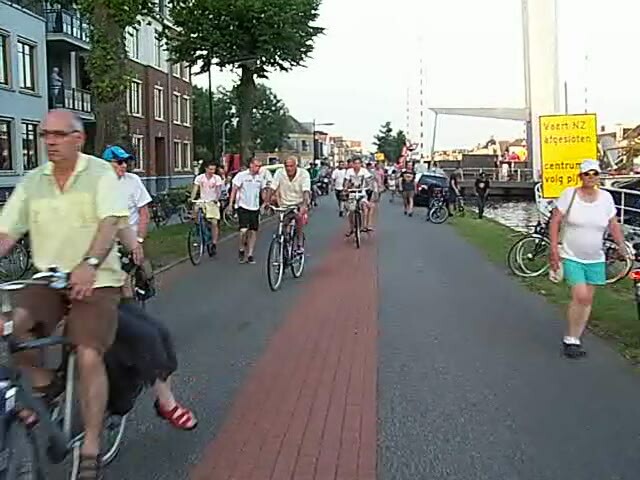 We still find that people are confused about how the Netherlands can be so pro-bike without being anti-car. Another example in Assen this evening. The same road as was closed to cars in order that a time-trial could take place earlier this week was closed to normal cars this evening so that David Coulthard could drive a Formula 1 car along it at a speed somewhat above the speed limit. I heard the noise and rode down there but was too late. Thousands watched it live but I arrived just in time to see a huge flow of bikes escaping the event start to head towards me so turned and rode back rather than get stuck in the rush. If you read this post and then find yourself with the desire to write a comment along the lines of "oh, but it's this", please go and read the big list of myths and excuses first and look for your objection within it. Almost all these myths have already been busted. If you think of a genuinely new reason why it is that your country has a low level of cycling then I'd be pleased to hear about it. I bet cycling in Wellington is interesting in the rain - got soaked there years ago - I think NZ may even be more obsessive than UK about weather! Thanks for this David. I would have thought the warmer cities would have even less of an excuse. One issue (excuse) I have wondered about but not seen much written on is the question of starting points. The argument is that when the Netherlands changed policy in response to the Stopp De Kindermord campaign, there was already a healthy cycling modal share. The same applies to the Danes. The UK, Australia and other places also once had healthy cycling modal shares but not any more. Now we see almost negligible modal shares. It follows (so the argument goes) that the English-speaking countries would be beginning with a much more difficult starting point. Just as an example, it might be said that we have had a few generations now of children growing up assuming it is perfectly normal to be driven everywhere and it would take a lot to change habits like that. I am not convinced myself. Wherever I look, modal share seems to be correlated most strongly to quality of infrastructure - even inside countries. The pent-up demand is obvious from things like the recent British Skyrides. If things were changed so that the choice was made easy, I think people would make it. And I think that applies across the board. The low starting point excuse is another form of the "It's in the genes / blood / veins of the Dutch" myth. Anyway, so far we have yet to see a country or city start from a 1% modal share and follow the Dutch so we are left with no example to point to that disproves the theory. As your widget says, we've been waiting 40 years and 150 plus days for some movement. Is the argument that we will be starting from nothing (unlike the Dutch) a myth as well or do you think there might be something in it? Some likely reasons for the above are that the helmet laws are not as restrictive in the NT as they are in the rest of Australia and Canberra has a lot of off-road cycle paths. Both cities also have a younger average population age than the rest of the country. I agree with you David, but I really do think heat can be a deterrent for folks here in LA, especially during the months of May, June, July, and August, since we lack bicycle friendly infrastructure. I cycle calmly and on an upright bike (sometimes on my Gazelle Impala) however I still end up sweating more than most people will tolerate, especially if commuting to work. 1) Proximity to speeding drivers. I get scared sometimes when I feel cars zooming past me and it makes my back sweat from nervousness. 4) On major streets that are tree-lined, often they shade primarily sidewalks and curbside parking. This means that even if I am in a bike lane, I don't get protection from the sun. More than ever, I feel the LA Bike Plan should be implemented in tandem with a "LA Tree Plan" so that 20 years from now streets that lack trees will have decent tree canopies and perhaps give relief to those cycling. Noting that when there is shade from trees that it is closer to the curb, I think if we were to implement cycle tracks, people cycling could get some relief from the sun. So, I would say heat is definitely a deterrent today with the many elements that make people cycling sweat unnecessarily so and exert more energy than if they were cycling in The Netherlands under the same temperatures. I have heard it mention that not only is temperature important, but also humidity and the dew point. Do you have that data for the cities mentioned? FWIW I don't know if it is or isn't important. 'Our own' , very similar swimming area is about 12 kms away, and yes, we gomthere by bike, too. One reason is that though there are huge parking areas for cars, there's always an enormous queue of cars waiting before the access gates, in the burning sun (kids whining in the back , dads getting hot and exasperated). Another reason is because cycling there is so relaxing, even at 34 degrees in the shade. The shade. Nearly all of the way to the beach is shaded by trees, as a lot of it is through some sort of nature park and along car-quietened roads, lined with large trees. If notmfor the trees, the ride would be a lot hotter. The first time I went to Bangalore, India, I noticed all the beautiful orange-blossoming trees lining the roads, making it a beautiful and pleasant city. Of course, nowadays there are rather too many cars there. Makes you think about how low-impact traffic and trees go together very well. Cycling in hot climates can be doable, provided there is shade as well, I think. I was in Germany on the day you describe, and it was very hot there too. Worse still, I was recovering from flu (or something similar), so I didn't feel so great. But I got on my bike and cycled to the freibad (a beach by the side of a lake). I pedalled fast enough to create a cooling breeze, but not so fast that I generated heat internally, and started to feel better. My speed was probably a steady 15km/h, but the lack of any need to engage in nonsense like vehicular cycling meant my low speed was not problematic. At the freibad I read a book in the shade of a tree, and took a few short swims. I started to feel better still. By the following morning I was ready for longer swims in the lake, and within a few days I was swimming several times a day, not just at the freibad, but in any lake where I could access the water. Each time I arrived by bike or kayak. On sunny days at the freibad there was a steady stream of people arriving or leaving by bike or kayak, many of whom went for a swim. Now compare that with the UK. Cycling is rendered unpleasant and potentially life-threatening by poor infrastructure design. It is considered bizarre and anti-social. Most people put on hard hats and hi-viz clothing, as if they were about to start work on a building site. Swimming in lakes is strongly discouraged or even banned with signs that say "DANGER - WATER - NO PADDLING - NO SWIMMING", as if it were some kind of strong acid (the BBC news went into great detail about the half a dozen or so people who died swimming in lakes and rivers this summer, but made no mention of the thousands of people who killed and injured themselves crashing their cars). Boating is limited to just 2% of waterways, and even on those you have to pay a licence fee. Like cycling it requires a helmet (German touring kayakers, even those who are children, don't even wear a buoyancy aid, let alone a hard hat); perhaps it's for protection from the violent attacks that British kayakers face from fishermen and landowners. It seems to me the UK has its priorities completely wrong. As an avid life-long cyclist from California, I've been a bit dismayed by the reticence others have to propel themselves around. One problem I see is at 35-40 degrees C, some fools start removing what little insulating and shading clothes they have, making conditions rather intolerable for themselves. Another thing is the roadways that have been engineered for automobile traffic with little regard given to pedestrians or cyclists, to a level I would argue amounts to criminal negligence. Cycling ranges from unsafe to foolhardy on about four out of five routes I can think of. I ride in the hills on gravel roads for fun, pavement road traffic has been too ugly since about the '70s. As we obviously can rule out a return to civility, I think bike paths would be a costly but worthwhile improvement.